In 2015 we passed a milestone of being in business for ten years. A lot has changed since 2005 and I would like to look back at our origins. Back then I was a single parent, my daughter Daisy and I used to spend a lot of time in our garden and I really enjoyed it. 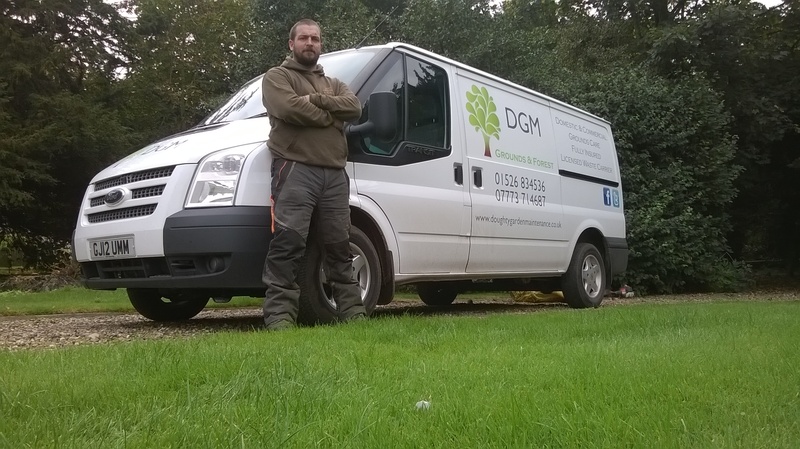 I have always had a deep interest in trees and plants, and have had several jobs within the industry in the past. I spent a lot of time in the evenings reading an endless amount of books on the subject as I did not have a television. When my daughter turned five and started school I wanted to take advantage of my new found free time and started doing neighbours and friends gardens. I was kindly given a long centre axle market barrow from the greengrocers in the village which was rotten and had one seized wheel, I took it home and built a new platform for it and got the wheel moving again. On this barrow I was able to transport an electric mower and a selection of hand tools. The mower and some of the hand tools belonged to my late grandad. Using this barrow I steadily built up a few customers around the village, including the pretty lady that owned a café who I later married in 2012! I wanted to take it to the next level, so after taking some advice from my dad (who has owned several businesses) I took the plunge and convinced the bank to lend me £4500, I took driving lessons and eventually passed my test, got my dad’s old Rover up and running, I bought a computer and got on the internet, I bought a new petrol mower a hedge trimmer and some other tools, I purchased Public Liability Insurance and informed the HMRC that I was now self-employed. I moved in with Gina and the business slowly grew, I saved enough money to buy my first van a 1999 Renault Kangoo, I upgraded equipment, got my tickets, bought a brand new trailer and all was well …. Until, one day whilst driving to a job a strange ticking noise was coming from the vans engine, unbeknown to me the auxiliary belt had stripped and was about to get tangled in the cam belt, the engine rattled to a stop and was damaged beyond repair. I was forced to buy a new van, this time I got a Transit. A much bigger van, time went on I continued to get better equipment and I now had the problem of finding enough time to complete all the work that was coming in. I was getting bigger jobs and I was struggling to accommodate my round of small gardens that I had been doing for several years. I asked my dad if he would work for me and do the smaller jobs leaving me time to take on the big things. We bought another Renault Kangoo and for a year my dad did a superb job on the small garden round. Dad was then approaching 70 and still doing his job as a cleaning manager for Tesco, he was getting tired, combined with the fact that it was struggling to cover the overheads we decided to end the second van and its round. So I was back on my own. Since then the old Transit needed a disturbing amount of welding to make it roadworthy, so that was sold and I got a Vauxhall Vivaro, underpowered and not suitable for pulling the trailer I soon got fed up with it and a year later I traded it in and now own a 4 year old Transit which is brilliant. I also took on an apprentice which then turned into part time employment, he has now left and joined the army. So now we’re here. Looking back I’ve gone from a barrow and an electric mower to a 12 plate Transit and a full complement of professional equipment (although my grandad’s shovel which is at least 50 years old is still in the van). I am very proud of how far I have come and would like to see the business continue to grow. I hope to continue securing the work that has got me where I am today and to acquire more equipment to enable me to take on even bigger jobs. I am looking into getting a four wheel drive vehicle to run alongside the van to enable me to get into sites where the transit just can’t go. I am pursuing contacts to get more forestry and woodland based work and I am planning on taking a hedge laying course, it is something I have done a bit of, quite successfully but I would like to add it to the skills my business can offer commercially. Each year has been more successful than the previous year so as long as that pattern continues I believe it is going in the right direction. So hopefully in 10 years’ time I will be writing another blog telling you what has been achieved.